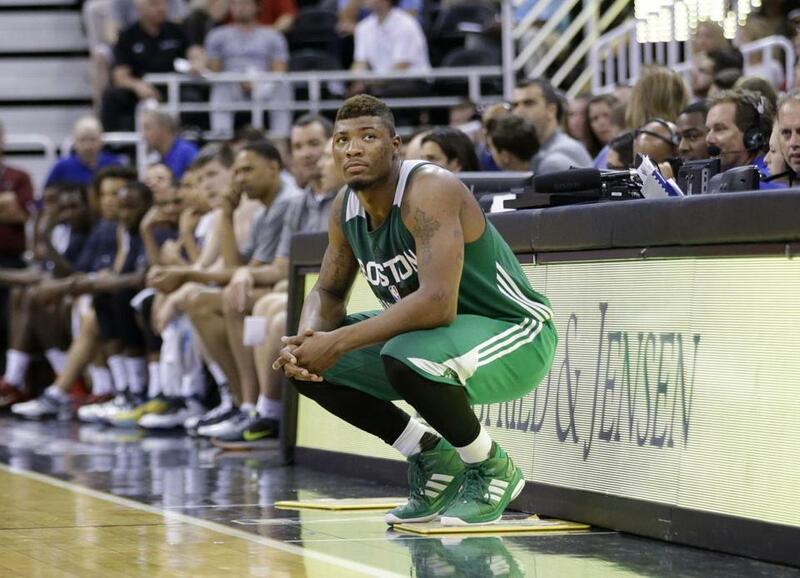 Marcus Smart will be sitting out the NBA’s first game in Africa. 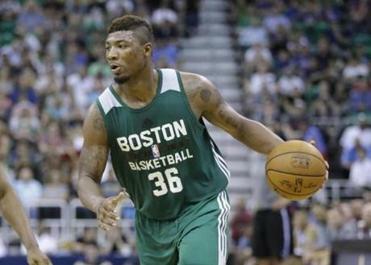 LAS VEGAS — Injured Celtics guard Marcus Smart is expected to miss an Aug. 1 exhibition game in South Africa, according to a league source. Smart dislocated two fingers in his right hand on Thursday night. Smart, guard Evan Turner, and coach Brad Stevens were to be among a contingent of NBA players and coaches taking part in the first NBA game played in Africa. But Smart will now stay in Boston as his fingers heal. Smart has not been available to speak to reporters since suffering the injury. One source said the guard is disappointed about missing the game in Africa but relieved that his injury is not more serious. With 6:34 left in the second quarter of Boston’s summer league game against Portland, Smart, guard Terry Rozier, and Trail Blazers forward Noah Vonleh all converged on a loose ball. Smart braced himself with his right hand as he fell, and his right index and middle fingers were dislocated. A bone in Smart’s hand also punctured his skin, requiring five stitches. Those sutures could slow Smart’s recovery, as they will affect his ability to regain range of motion in his fingers. Still, the Celtics were relieved that the X-rays on Smart’s hand were negative. The injury occurred in the second quarter of Thursday night’s game against Portland. X-rays were negative and Smart needed five stitches. Celtics assistant coach Micah Shrewsberry said Smart will remain with the team as long as they are in the summer league playoffs, partly because he wants to support his team, and partly because the medical staff is here. Smart will undergo further evaluation when he returns to Boston. Turner sat courtside with Stevens and assistant general manager Mike Zarren as Boston defeated the Blazers, 91-85, Thursday night. Turner said he came to town to support teammates and to attend a bachelor party for former 76ers teammate Andre Iguodala, the NBA Finals MVP. Turner said he was pleased with the Celtics’ offseason additions and impressed by the team’s rookie class, even if it does make for an even more crowded backcourt. Turner said last season’s momentum combined with the new additions should help the team take another step. For Celtics forward Jonathan Holmes, the Las Vegas Summer League has served as one big audition. The undrafted free agent from Texas has played very well here, averaging 13 points and 6.3 rebounds per game. At 6 feet 8 inches, Holmes is capable of defending big men while also stretching the floor on offense — he has made 8 of 15 3-point attempts this week. But Holmes knows the realities of the Celtics’ roster crunch, and that there is a good chance his best hope at securing an NBA contract will come elsewhere. He asked his agent, Zach Kurtin, not to update him on possible interest from teams until the summer league is over because he does not want it to be a distraction. “I’m just trying to play these next few games and focus on basketball,” Holmes said. Holmes, widely projected as a second-round pick, was a hot commodity on the free agent market after going undrafted. He said he let Kurtin find the best fit for his style of play, and he has been very comfortable in the Celtics’ system. Now, he hopes, a team will take a chance on him. The Celtics will face the Spurs in the quarterfinals of the Las Vegas Summer League playoffs Saturday at 4 p.m. The winner advances to Sunday’s semifinal against the Hawks or the Mavericks.